Infrastructure development projects like smart cities, growing share of renewable energy combined with initiatives taken by the government for rural electrification are the key driving factors for package substation market in India. The Government of India has taken initiatives such as Make in India, UDAY, and Deendayal Upadhayaya Gram Jyoti Yojna, which are expected to impact the growth of package substation over the next six years. According to 6Wresearch, India Package Substation market is projected to grow at a CAGR of 7.8% during 2017-23. Expansion of power transmission and distribution infrastructure across the country is anticipated to create key demand for package substations in India. Additionally, several government programs to increase the penetration of clean energy would drive the growth of package substation market. In India, Western region accounted for the largest revenue share in the country for the year 2016, followed by the Southern region. States such as Maharashtra, Andhra Pradesh, Telangana, Gujarat and Tamil Nadu leads the market in terms of industrial investments, with Uttar Pradesh and Haryana leading the market in terms of power sector investments in 2016. During 2017-23, Western and Southern regions are expected to continue their dominance with share of northern region also expected to increase in the forecast period. 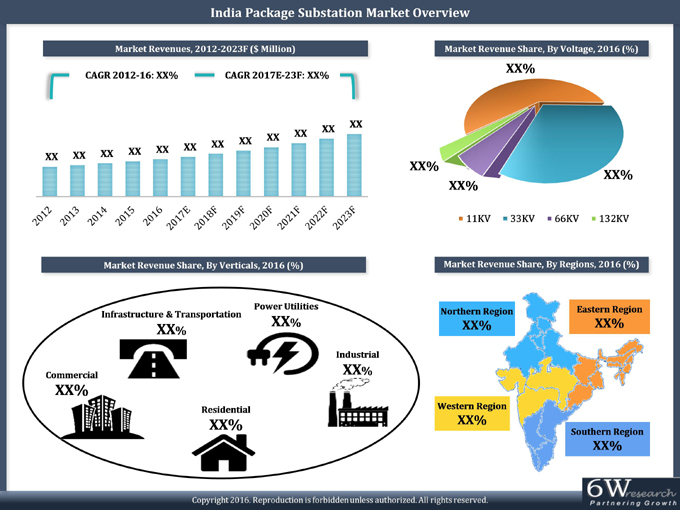 The report thoroughly covers the India Package Substation market by voltage, verticals and regions. The report provides an unbiased and detailed analysis of the on-going trends, opportunities/high growth areas, market drivers which would help the stakeholders to device and align their market strategies according to the current and future market dynamics.